BACKGROUND: Treatment of aggressive benign bone lesions with curettage, burring, cementation and plate augmentation is a widely accepted treatment. We have used the above method utilising a locked plate, rather than conventional plating methods, facilitating immediate stability and early mobilisation. We hypothesised that this joint-preserving method would provide an economic alternative to megaprosthetic joint replacement without compromising good functional outcomes. METHODS: Patients with peri-articular aggressive benign bone lesions were treated with marginal excision, curettage, burring and cementation. This was augmented with a locked plate. Liquid nitrogen was used as an adjunct where feasible. Functional assessment and radiological recurrence was assessed at follow-up using the Musculoskeletal Tumour Society Score (MSTS) and routine X-rays. RESULT: The average MSTS score was 88%. Average follow-up time was 21 months. To date, no revisions have been performed for recurrence or pain and no significant complications have occurred. CONCLUSIONS: Our early results in a small series make us optimistic that this may be an alternative to immediate megaprosthetic reconstruction; furthermore, this may provide a useful intermediate step in the treatment of aggressive benign peri-articular bone tumours with some degree of associated joint deformation without significantly compromising later prosthetic reconstruction. The treatment of aggressive benign peri-articular bone tumours is challenging. Close proximity to joint surfaces makes excision and reconstruction difficult and functional impairment likely. This, together with the fact that the majority of these tumours occur in younger patients who have a potentially long economically active life span, makes it imperative that optimal post-operative function is achieved. Endoprosthetic reconstruction following tumour resection is associated with several disadvantages. Extensive soft tissue dissection may result in delayed mobilisation and even instability. Prolonged postoperative physiotherapy and hospitalisation are often required. Despite this, full range of motion may not be regained and subsequent functional impairment results. Difficulty in aligning megaprosthetic implants may result in early failure. Younger age group, accelerated implant wear and aseptic loosening may necessitate several revision surgeries. Arthroplasty is very expensive and the complication rate tends to increase with each revision operation, especially infection and wound complications. Post-surgical infection rates of up to 16%, following megaprosthetic reconstruction, have been reported.11 This is particularly evident when wide excision has been performed as the initial treatment.  Early mobilisation and rapid return of function could be expected due to reduced soft tissue dissection and immediate postoperative stability.  The incidence of infection is lower.  Conversion to a later endoprosthesis could still be possible. This study was devised in order to assess the functional outcome of patients suffering from aggressive benign peri-articular tumours treated in this manner. A retrospective review of 15 patients, who presented to the Tumour and Sepsis Unit at the Charlotte Maxeke Johannesburg Academic Hospital between March 2005 and March 2009 suffering from aggressive benign peri-articular bone tumours, was performed. Only 14 patients were available for follow-up, as one patient failed to attend any follow-up clinics. There were seven male and seven female patients. The average age of the patients was 28 years, with ages ranging from 14 to 63 years. 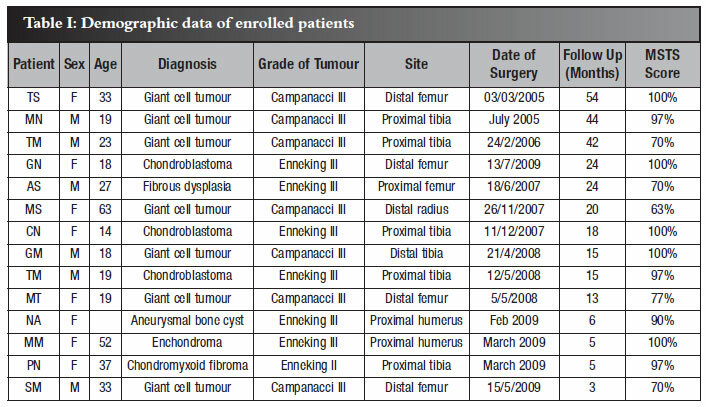 All 14 patients presented with a single clinically benign bone tumour; 13 of the 14 tumours were graded as Enneking grade 3 and further classified as Campanacci grade 3 (in the case of the giant cells tumours). One patient was staged as Enneking grade 2. There were seven giant cell tumours (Figures 1 and 2), three chondroblastomas, one aneurysmal bone cyst, one chondromyxoid fibroma, one enchondroma and one fibrous dysplasia. Nine of the tumours were located around the knee, with five occurring in the proximal tibia and four in the distal femur. Two were found in the proximal humerus, one in the distal radius, one in the proximal femur and one in the distal tibia. Eight of the lesions were associated with pathological fractures and six of the lesions revealed eroded articular cartilage and were, therefore, intra-articular. All of the tumours were larger than 10 cm in diameter, and occupied more than 50% of the width of the subchondral bone. Average follow-up time was 21 months (range: 3 months-54 months) (Table I). 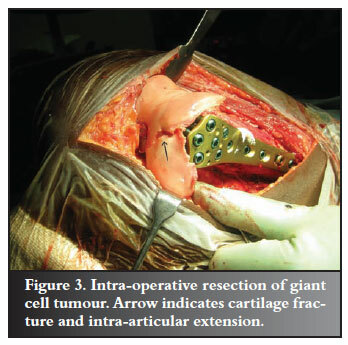 All patients were treated with a marginal excision of the tumour followed by burring, curettage and PMMA cementation. This was augmented with a locked plate (Figures 3, 4 and 5). A variety of plates was used from different suppliers; however, all were similar in that they provided a rigid single construct by means of the capability of locking the screws within the plate. Liquid nitrogen was used as a further adjunct whenever feasible. In six of the 14 patients the tumour had eroded through the articular cartilage into the joint preventing the use of liquid nitrogen. All patients were operated on by the same surgeon. Physiotherapy was commenced on the second post-operative day. Patients who had tumours of the lower limb were encouraged to weight bear as soon as possible. 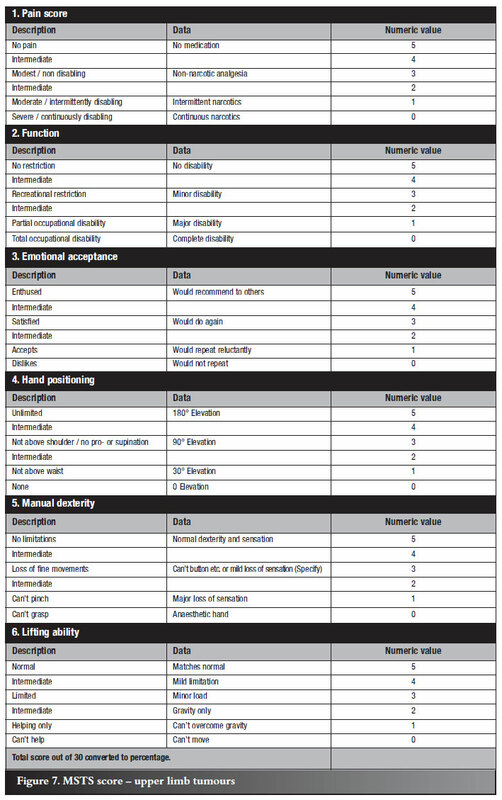 Functional assessment was performed at follow-up using the Musculoskeletal Tumour Society Score (MSTS Score)11,12 at 6 weeks, 3 months, 6 months, 12 months and 6-monthly thereafter, and possible recurrence was assessed clinically and radiologically (Table II). 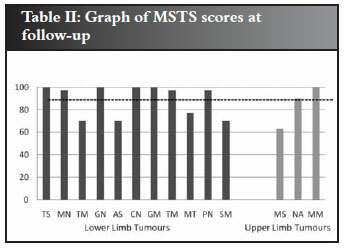 The MSTS scoring system assesses the functional outcome of patients after tumour treatment. It consists of six categories. Both the upper and lower limb scores have categories of pain, emotional acceptance and function. The upper limb score has additional categories of hand-positioning ability, manual dexterity and lifting ability. The lower limb score has additional categories of walking ability, gait and use of supports. 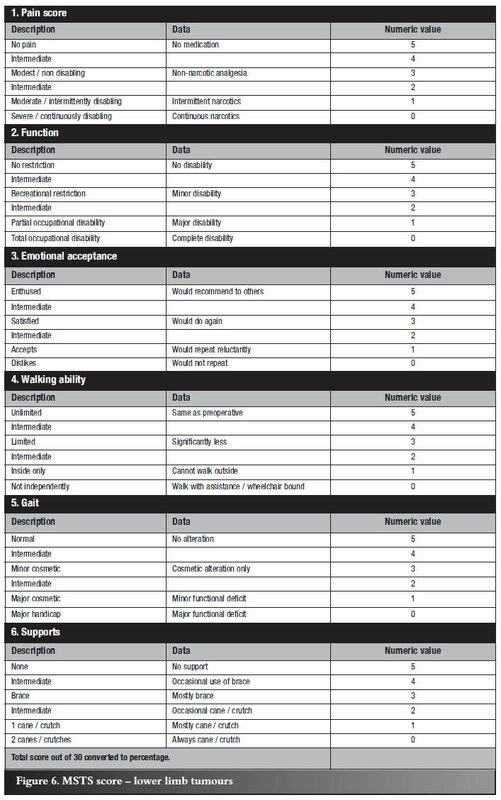 Points are given for abilities in each category with the total out of 30. This score is then converted to a percentage, with the higher the percentage the better the functional outcome (Figures 6 and 7). Radiological recurrence would be evident as an increasing radiolucent line at the bone-cement interface. On functional evaluation at last follow-up the average MSTS score was 88% (range: 63%-100%). Nine of the 14 patients had a MSTS score of greater than 90%. All patients who had tumours of the lower limb were partially weight bearing at 2 weeks post-operatively and where these occurred around the knee, flexion of at least 90º was achieved by the time of discharge and an average MSTS score of 89%. The average MSTS score among the upper limb group was 84% with all patients able to return to their former occupations. Radiographically there has been no evidence of recurrence in any of the patients. Twelve of the patients exhibit no radiolucent line at the bone-cement interface. 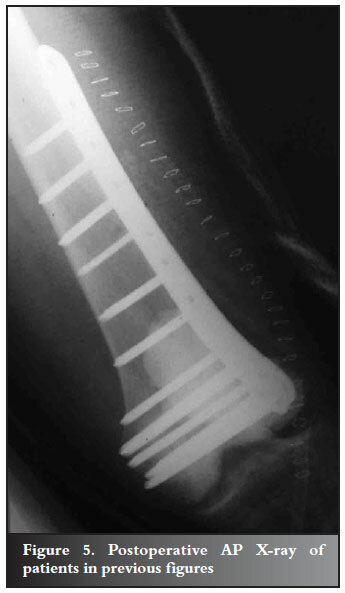 The remaining two patients display a radiolucent line of 1 mm, which was evident on the immediate post-operative X-rays and remained constant in size. In fact, two of the patients displayed hypertrophy of subchondral bone. To date there have been no significant complications. All patients have returned to their former occupations. One patient, however, was re-admitted for a week for intensive physiotherapy. Another patient, whose follow-up time was 4.5 years, is a potential candidate for revision surgery using a megaprosthetic knee replacement due to radiologically advanced osteoarthritic changes in his knee. He feels his functioning and pain levels are within acceptable limits and is refusing further surgery at present. It is well documented that it is desirable to maintain the joint surface in patients with peri-articular bone lesions when performing limb salvage surgery.2-4 This preservation of the joint is associated with better functional outcomes as well as avoiding the complications associated with megaprosthetic replacement. This was confirmed in our study with the average MSTS score of 88% as opposed to the studies of Hayashi and Per-Ulf Tunn,4-6 where average MSTS scores of 88% and 74% respectively were documented. The average MSTS score achieved in our study is lower than that achieved by Gitelis et al. However, he divided his patients into two groups. The first group consisted of patients with giant cell tumours staged as Campanacci grade 2 and 3, with the second group consisting only of tumours graded as Campanacci 2. The first group was treated with wide resection and joint reconstruction whereas the second group was treated with a joint-preserving surgery. All of our patients, except for one, were graded as Campanacci 3 or Enneking 3, with eight of the lesions associated with pathological fractures, and six of the lesions revealed eroded articular cartilage and were, therefore, intra-articular. The patient's tumour, graded as an Enneking grade 2, extended across more than 50% of the subchondral surface and was therefore included in the aggressive benign group of peri-articular tumours. The use of a locking plate confers immediate stability by providing a single rigid construct together with the adherent cement. This facilitated early rehabilitation which we feel is associated with a better functional outcome. All of our patients with tumours affecting the lower limb were partially weight bearing at 2 weeks post-operatively. At last follow-up, only one patient utilised a ranger brace when walking more than 500 m; the rest mobilised completely independently. In addition, the apparent hypertrophy of the subchondral bone, clearly demonstrated in two of our patients, may further corroborate the functioning of this single rigid construct. This rigid construct enables appropriate loading of the joint and avoids shear forces, which may lead to premature failure. However, further investigation and follow-up is necessary to confirm this. 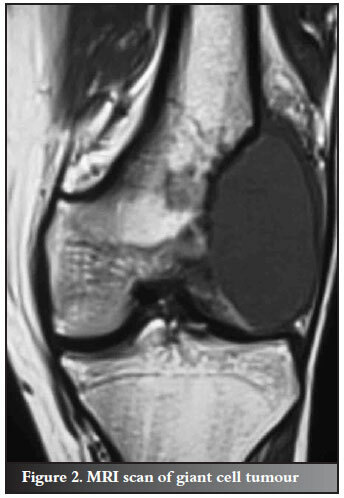 This group of patients presented with tumours that had resulted in pathological fractures or extended intra-articularly or occupied more than 50% of the subchondral bone. They were therefore classified as aggressive in nature and benefited from the use of a locked plate construct. 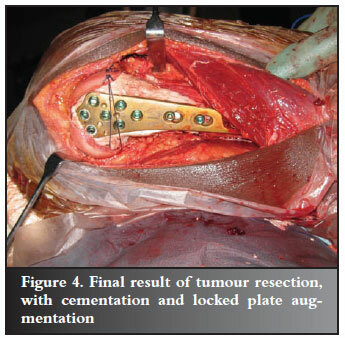 Smaller, less aggressive tumours or those not peri-articular will not necessarily benefit from a locked plate construct. The patient series of De Camargo et al.2 reported a 12% incidence of osteoarthritis at long-term follow-up of 24 years. This was evident within patients graded as Campanacci 3 tumour (n=25), who were treated with curettage, cauterisation and cementation. In our study one of our patients (1/14=7%) demonstrated evidence of osteoarthritis at 3.5 years post-op, notably within the lateral compartment of his knee, which had been destroyed by the tumour. De Camargo et al. also reported a 6% infection rate. Two other studies, one reporting the incidence of infection in allograft,9 and one reporting that occurring in megaprosthetic reconstruction,11 confirmed infection rates of greater than 10%. None of our patients developed any infection. Four of the patients in our series had MSTS scores of 70% or less. 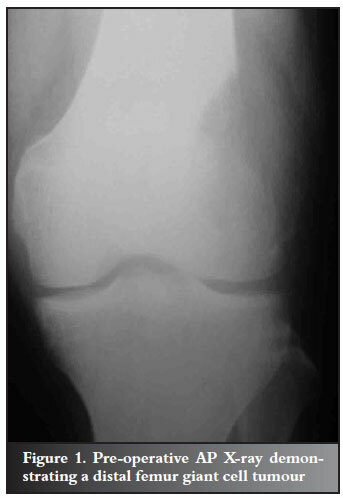 Two of these patients presented with an intra-articular fracture, with one of them developing frank osteoarthritis, within the follow-up time period. It is likely that those patients with intra-articular extension will develop some form of osteoarthritis and potentially require conversion to a megaprosthetic replacement in the future. The third patient with a score of less the 70% was the oldest patient in the series, who presented with a giant cell tumour of the distal radius. Fine motor co-ordination and dexterity of the hand are difficult to restore. In our opinion this form of treatment is best suited to lower extremity tumours, where the main function to be restored is weight-bearing and locomotion. This treatment plan is not intended to replace megaprosthetic replacement of the joint. On the contrary, in several of our patients we anticipate the necessity for this at some stage. This method may assist in postponing arthroplasty and thereby gaining valuable years of bone and joint-preserving function. This is of extreme importance to young patients in whom the longevity of a megaprosthetic joint replacement may be suboptimal. The use of a limited surgical dissection and smaller metal implant may be associated with lower rates of post-operative infection, as has been demonstrated in our study. In a country such as South Africa, where there is a high HIV prevalence, infection may be extremely difficult to treat and any method which could diminish infection rates is desirable in limb salvage surgery. There are also economic considerations, particularly in a developing world setting, with our construct being a far more affordable alternative. Some of the drawbacks of our study are its small sample size, consisting of only 15 patients, as well as our relatively short follow-up of 21 months. In addition, although this was a retrospective analysis, no aggressive giant cell tumours have ever been treated in our unit with initial - or subsequent megaprosthetic replacement, with this being our preferred method of treatment. Notwithstanding our small study and limited follow-up time, the results we have obtained to date appear to indicate that the use of a marginal excision, combined with a rigid locked-plate cement augment, may be effective in treating young patients suffering from peri-articular and even intra-articular aggressive benign bone tumours. The content of the article is the sole work of the authors. No benefits of any form have been received from a commercial party related directly or indirectly to the subject of this article. Informed consent was obtained from all participants in this study.